Garnet also known the birthstone of January comes from the Latin word "granatus," meaning "grain" or "seed." This name was given to the garnet because of its close resemblance to the succulent pomegranate seed. There are many myths and legends surrounding the garnet. One Biblical legend is that Noah hung this gem on the ark to light his way through the dark and stormy nights of God's wrath. Garnet is commonly distinguished with it's red color but it also come with a range of colors including muted yellows, vibrant oranges,colorless, occasionally black, brown rosy pinks, lime greens, and violets the reason of this is that there are distinctive combinations of elements with each particular gems such as calcium, iron, and manganese. 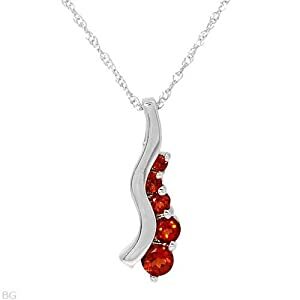 ~ The most common of the garnet family and is the deep red red to red-brown stone most often thought of when people think of garnet. ~Major sources of Almandine are Madagascar, India, and Sri Lanka. 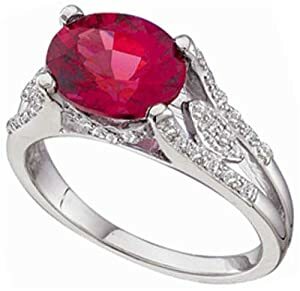 ~ is the name to describe the pinkish, purplish or lavender Red Garnets which are a mixture of Almandine and Pyropone. They are not as dark as Almandine Garnets. 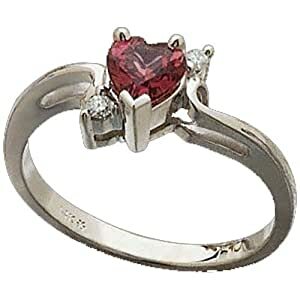 They are the most popular garnet seen in fine jewelry today. ~ Major Sources are Africa, India, and Sri Lanka, while Brazil is producing a dark purplish Rohodolite also known as Grape Garnet. 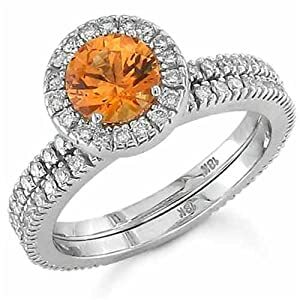 ~ The color of Malaya ranges from dark orange to beige-orange, and rarely a peachy-cinnamon color that is one the loveliest and unusual in the gem kingdom, Stones over 5 carats are rare and the largest Malays on record are under 100 carats. ~Major Sources are Tanzia and Kenya. ~ is found in a wide range of hues ranging from colorless to shades of pink, orange, yellow and green. These rare and beautiful gemstones are found at only a few localities on earth, and seldom in large sizes. ~ are commonly seen in bright shades of intense Orange or reddish Orange. One type of Spessartite garnet growing in popularity is a newly discovered garnet from Namibia, which is a bright orange shade of Spessartite. ~ Sources Namibia, Ramona in San Diego County, California, Brazil and a few locations in Africa. ~ is typically described as very saturated red deep red wine or deepest blood red. small Pyrope garnets found in Arizona are called anthill garnet because they are mined by ants, who carry them up when they are excavating their anthills. ~Source: Arizona- small pyrope garnets. ~ is the most desirable of all garnets, with a wonderful purity and intensity of its beautiful green color. Until Tsavorite was discovered in the late 1960's there was no other gemstone but emerald that could offer the gem buyer such a rich, dark green color. This magnificent green garnet has been in great demand for jewelry since its discovery, and for good reasons: it is harder than emerald, more durable in jewelry, less included than emerald, more brilliant when faceted, and is much rarer than emerald. ~ Hessonite garnets, a variety of Grossular, come mostly in shades of orange-brown colors and are sometimes called cinnamon garnets. Although fairly inexpensive, they are not often seen in modern jewelry. 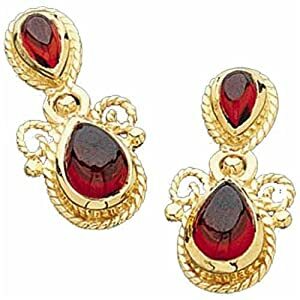 They were very popular however, in Victorian times, so they are sometimes seen in antique jewelry. 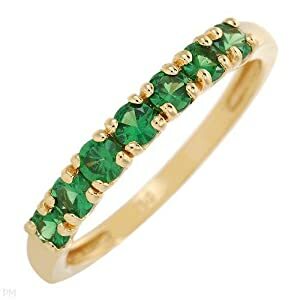 ~With its beautiful green color, for many years the queen of the garnet family was the Demantoid garnet, which was discovered in Russia's Ural Mountains in 1868. 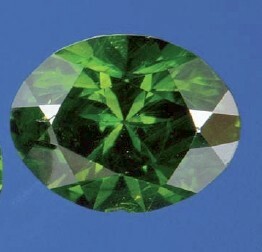 Though bright and attractive, Demantoid was available mostly only in small sizes. ~In 1994, in the country of Mali, Africa, a unique yellow-green to yellow brown garnet was discovered. It is principally adradite, mixed with some Grossular. Occasionally specimens from this site are colored a deep green dematiod color. An iridescent Andradite garnet, showing a rainbow play of colors was mined from Mexico in the 1990s, and a similar iridescent Andradite material occurs in Nevada. ~ Another mixed garnet species material mined at Tunduru gravels in east Africa shows a significant color change, some of the material going from Red to blue or from pink to green colors when going from outdoor to indoor lighting. Some color change garnet comes from Madagascar as well. This material is quite rare, and usually fairly expensive for a garnet.